Matthew Wood is a renown American voice-over actor and a sound editor. 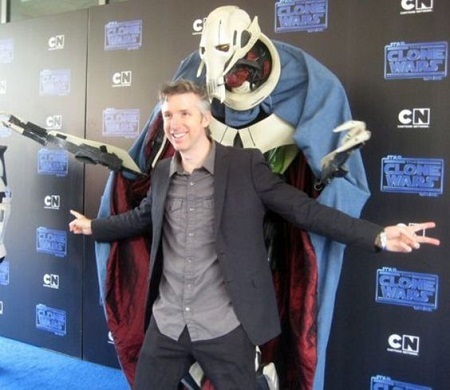 He is best known for voicing the character General Grievous in the Star Wars series. Matthew Wood was born as Matthew Russell Wood on the 15th of August, 1972 in Walnut Creek, California. He has not disclosed the name of his parents. Matthew Wood (age 44) is best known for his remarkable work on 'Star Wars: Episode I - The Phantom Menace' (1999), 'Star Wars: Episode III - Revenge of the Sith' (2005) and 'Star Wars: Episode V - The Empire Strikes Back' (1980), starring Mark Hamill, late Carrie Fisher, and Harrison Ford. Moreover, he has received two Academy Award nominations in a category of Sound Editing: for Paul Thomas Anderson’s There Will Be Blood, starring Ciarán Hinds, at the 80th Academy Awards as well as for Pixar sci-fi film WALL-E at the 81st Academy Awards. Lego Star Wars: The Freemaker Adventures, featuring Vanessa Lengies, is his animation and video games in a role of RO-GR/Roger in 2016. There is no such news of Matthew Wood dating someone or having a wife or married. As far as his relationship is concerned he is currently single at the moment. It has been assumed that Matthew Wood was paid evenly for the efforts he put in the making of the film. Matthew stands with a height of 6 feet (182 cms) and is body weighs around 85 kgs (187 lbs). American sound engineer as well as an employee of Skywalker, Matthew Wood born as Matthew Russell Wood puts his first step in this world on 15th August 1972 in Walnut Creek, California. Matthew Wood made an appearance in Adult Swim's 'Robot Chicken', a stop-motion sketch comedy television series, created and executive produced by Seth Green in 2008. 'Robot Chicken' is based on "Twisted ToyFare Theater", a humorous photo comic-strip appearing in ToyFare: The Toy Magazine. Matthew Wood has nominated for Academy Award for Best Sound Editing for a popular movie named Star Wars: The Force Awakens, an epic space opera film directed, co-produced and co-written by J. J. Abrams. Matthew Wood worked for an animation and video games entitled 'Lego Star Wars: The Freemaker Adventures', a computer-animated action comedy television series based on the 'Lego Star Wars' theme, and premiered on 'Disney XD' in a role of RO-GR/Roger. Matthew Wood worked for a movie named 'The Rock', an action thriller film directed by Michael Bay as well as produced by Don Simpson and Jerry Bruckheimer, written by David Weisberg and Douglas S. Cook as an assistant sound designer. Matthew Wood worked for a movie named 'Armageddon', a science fiction disaster film directed by Michael Bay, produced by Jerry Bruckheimer, and released by Touchstone Pictures ,he is an assistant sound designer of this movie.